As promised here are the Coconut Funfetti Cookie Sandwich's. They turned out really good, very sweet though, I actually had a pretty hard time finishing one. For making the cookies I used the funfetti cake mix; I left out the water and added the oil, eggs and a bit of coconut for a fun flavor. I didn't really know how long to bake them for so I ended up putting them in for 15 minutes at the suggested 350 degrees (convection), they were golden on the edges and the insides were nice and chewy (kind of a mix between a cookie & brownie). You may have to play around with the timing a bit. For the filling I used my left over almond buttercream frosting from the Easter cupcakes. The combined taste of coconut from the cookies and almond from the frosting made them delicious! I liked this idea because I love funfetti but not necessarily always in a cake form. 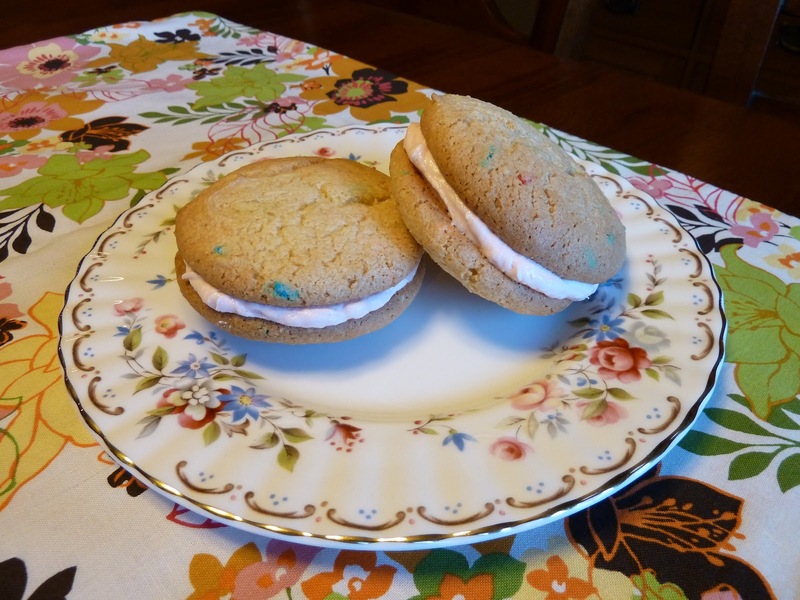 I thought about doing cupcakes, but the frosting I had left over from my Easter cupcakes wouldn't have been enough to cover them all, so cookie sandwich it was!